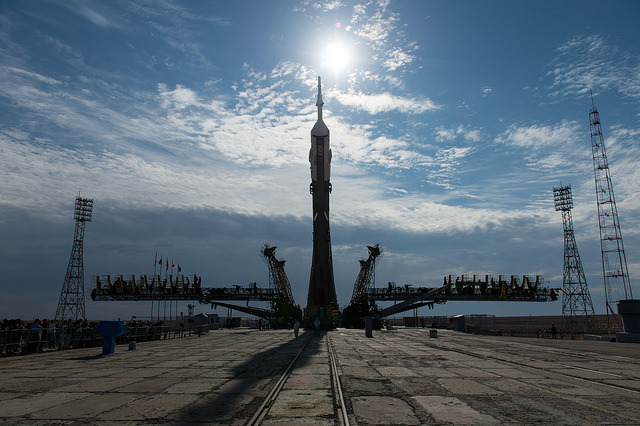 July 20, 2015 – The next three crew members bound for the International Space Station saw their Soyuz TMA-17M spacecraft roll out to its launch pad today at the Baikonur Cosmodrome. Cosmonaut and Soyuz Commander Oleg Kononenko, NASA astronaut Kjell Lindgren and JAXA (Japan Aerospace Exploration Agency) astronaut Kimiya Yui will launch July 22 at 3:02 p.m. MDT from Kazakhstan (July 23, 3:02 a.m. Baikonur time) for a five month mission on the space station. NASA TV coverage will begin at 2 p.m. MDT. The trio will ride to space in a Russian Soyuz spacecraft, which will rendezvous with the space station and dock after four orbits of Earth. Docking to the space station’s Rassvet module will take place at 8:46 p.m. NASA TV coverage of docking will begin at 8:00 p.m. The crew will open the hatches between the Soyuz and the station around 10:25 p.m. Wednesday, July 22. Expedition 44 Commander Gennady Padalka of Roscosmos, as well as Flight Engineers Scott Kelly of NASA and Mikhail Kornienko of Roscosmos, will greet Lindgren, Kononenko and Yui. NASA TV hatch opening coverage begins at 9:45 p.m. Wednesday. Lindgren, Kononenko and Yui will remain aboard the station until late December. Kelly and Kornienko, who have been aboard since March 27, will return to Earth in March 2016 at the end of their one-year mission. Padalka, who also has been aboard since March 27, will return to Earth in September, leaving Kelly in command of Expedition 45. Together the six crew members will continue the several hundred experiments in biology, biotechnology, physical science and Earth science currently underway and scheduled to take place aboard humanity’s only orbital outpost.